Windows 10 Calculator App: All You Want To Know! Windows has included a native calculator program since its early days, and the freshest Windows 10 is no different, having it as a modern, universal app. In fact, the Windows 10 calculator app is one of the most handy and powerful built-in apps. It includes multiple calculator modes, and detailed calculation history. But that’s not all. Windows 10 calculator app even includes a comprehensive unit converter, that lets you convert everything from volume to power to angle. Sounds interesting? Keep reading past the break, it surely is. In the above image, the standard/default calculator is displayed on the left. It consists of numeric keys, as well as keys for basic arithmetic operations, and memory management options. There’s also a history button on the top right corner, which can be used to view the recently performed arithmetic operations. Clicking the hamburger icon on the top left corner reveals a scrollable menu, illustrated on the right. 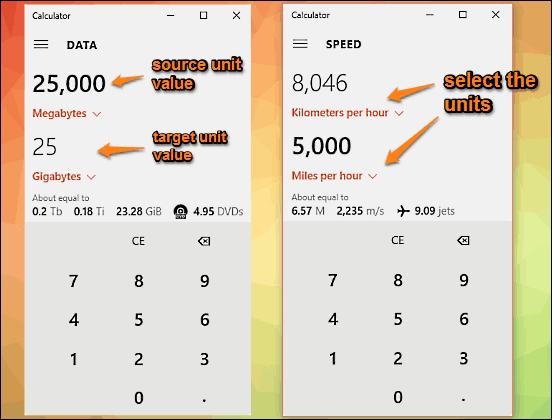 As evinced by the screenshot, it can be used to access the other two calculator modes (scientific and programmer), and switch to the unit converter mode (and its sub-categories). 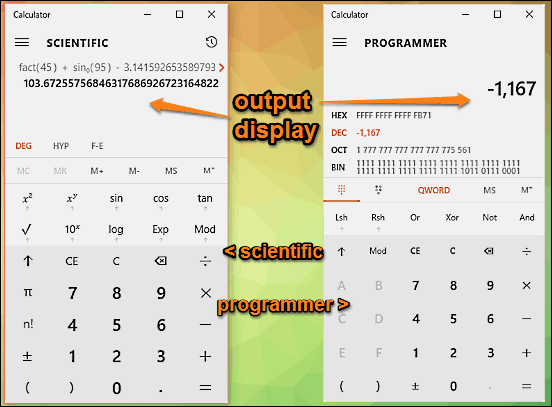 How To Use Scientific And Programmer Modes In Windows 10 Calculator App? 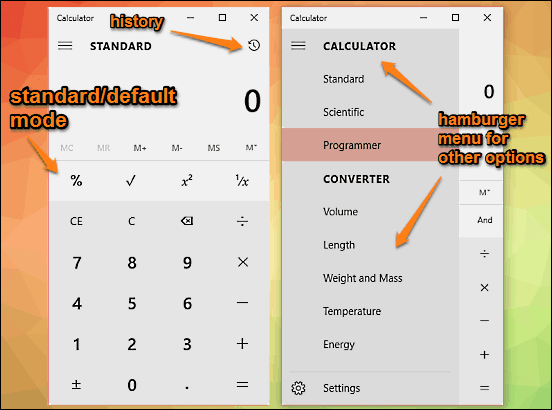 How To Use the Unit Converter In Windows 10 Calculator App? Also See: Windows 10 Alarms And Clock App: All You Want To Know! The Windows 10 calculator app is an insanely powerful and useful app, and can come in really handy in making calculations a breeze. Add the super cool unit converter it totes to the mix, and this thing gets even more awesome. Give it a shot, and let me know your thoughts in the comments section down below. September 16, 2015 Windows 10 Alarms And Clock App: All You Want To Know!